I'm Hanna and I blog over at bouffe e bambini where I share lots of recipes, fashion posts, and some inspiration. I love new friends so come by and visit anytime. Today I am going to share a little St. Patrick's Day Recipes that is really fun and really easy!!!! 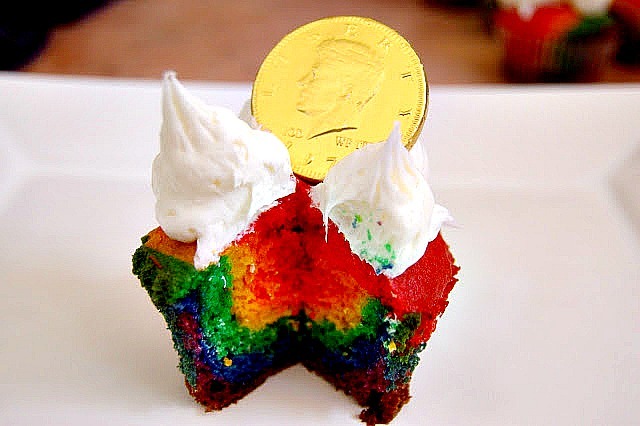 St. Patrick's Day is right around the corner and I will take any excuse to bake something pretty and fun. 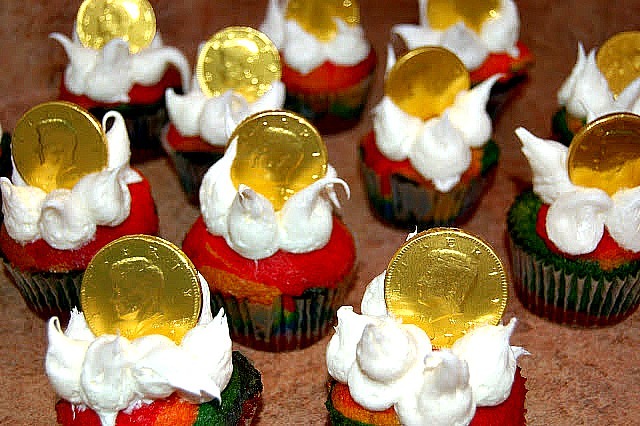 I have wanted to make rainbow cupcakes for a long time so I had the idea to make rainbow cupcakes with white icing for clouds and gold coins for the treasure at the end of the rainbow! Which is all associated with leprechans right? Well, that was my idea for St. Patrick's Day! 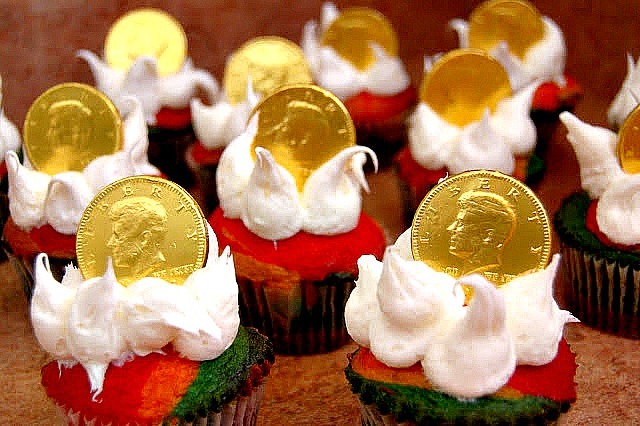 But you could easily make these for ANY occassion!!! So fun and so easy! I will start off by saying this recipe makes about 14-17 cupcakes. It will not yield 24 as the box says because of all the transferring of batter. I suggest using 2 boxes of cake mix if you want 24 cupcakes. All you do is mix up the batter as the box says and then separate it into 6 different bowls, one for each color of the rainbow. Now add the food coloring. The directions on the back of the food coloring box worked great for me while I was mixing up my colors. 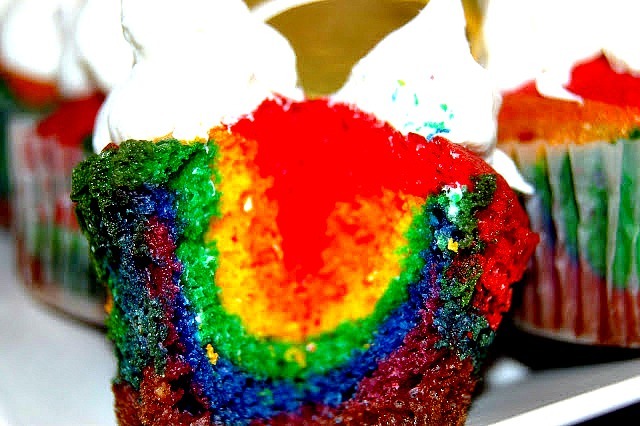 Make sure they are VERY vibrant because they will fade slightly when baked. 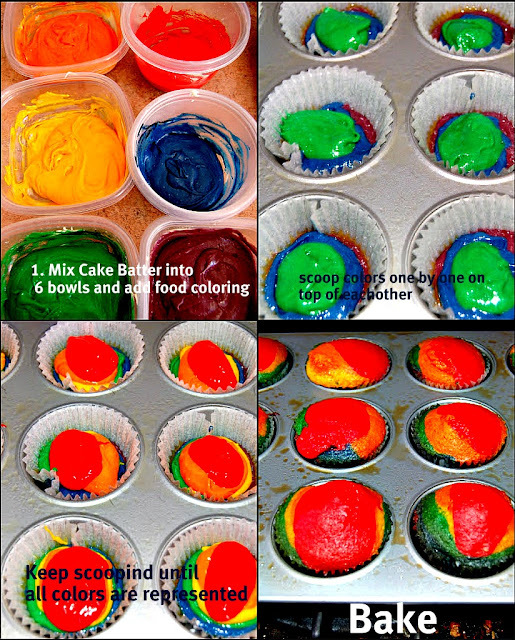 Now place one spoon full of whichever color you want on the bottom batter into the cupcake liners. I chose to have purple be the bottom. Next spoon in the second color. Repeat this until you have all the colors desired. Keep in mind that you have to use small spoon fulls or you will fill the cupcake too quickly and you won't be able to fit all your colors. That's it! When your finished layering simply bake and cool. I don't have a pastry bag so I just used a gallon size zip lock and cut a tiny hole in the corner where I placed my piping tip! Fill the bag and apply icing to look like clouds. If you can't find a piping tip with a large enough hole simply cut one of the plastic ones to the size you want. Thank you so much Laura for having me. It has been such an honor!!!!!! These are too awesome! I wish I was at home with a kitchen so I could test them out! Looks fun! Though st. Patrick's day doesn't quite register on our calendars, this is a great activity to be doing with the kids. How totally cool! My little man loves to be in the kitchen and this will be so much fun for us!